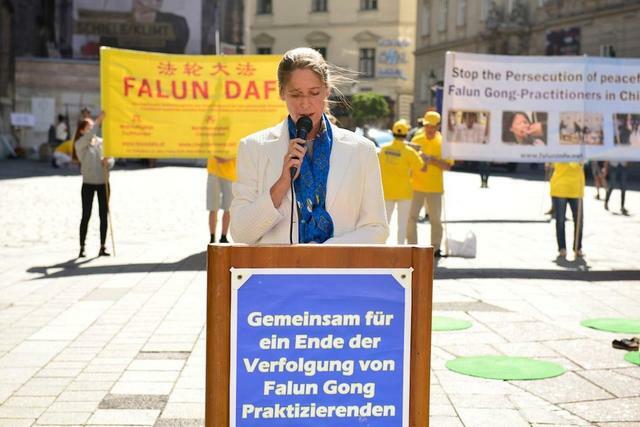 Falun Gong practitioners from Austria and other European countries had a rally and march on Stephansplatz, a landmark at centre of Vienna, on August 23 to protest the Chinese Communist Party's brutal persecution of Falun Gong practitioners and killing of practitioners for their organs. 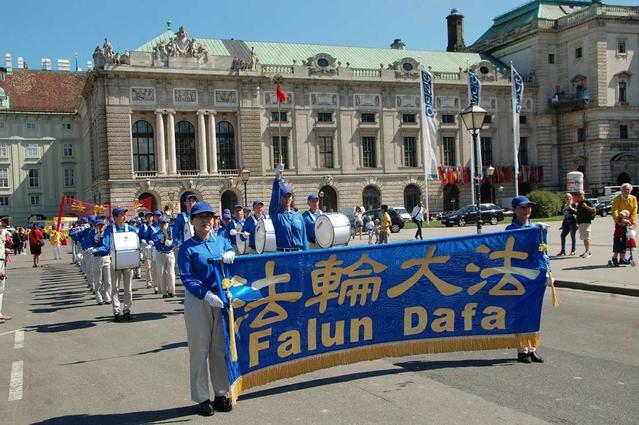 The events started at 8 a.m. with practitioners demonstrating the Falun Gong exercises and a performance by the Tiao Guo Marching Band. 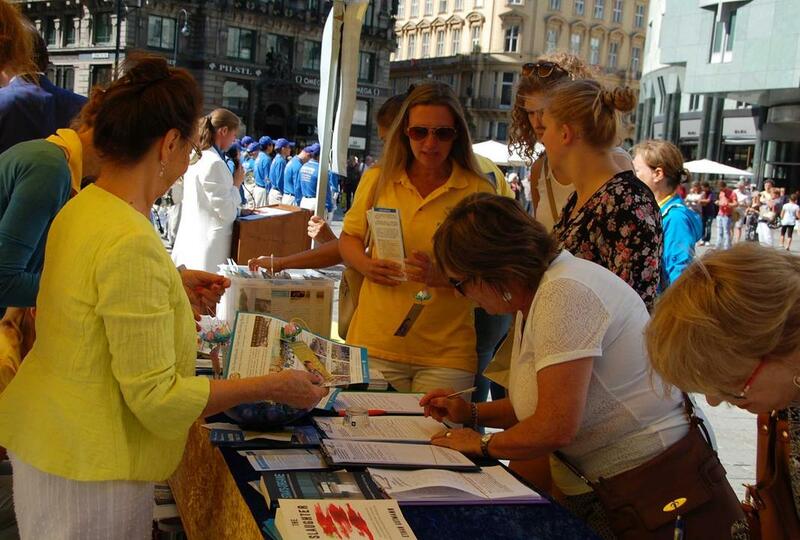 Many people asked to learn more about the event and signed a petition against the persecution campaign being carried out by the Chinese regime. The march started at noon, led by the Tian Guo Marching Band and followed by performers in fairy costumes, an exercise demonstration, and a reenactment of the live organ harvesting atrocities in China. 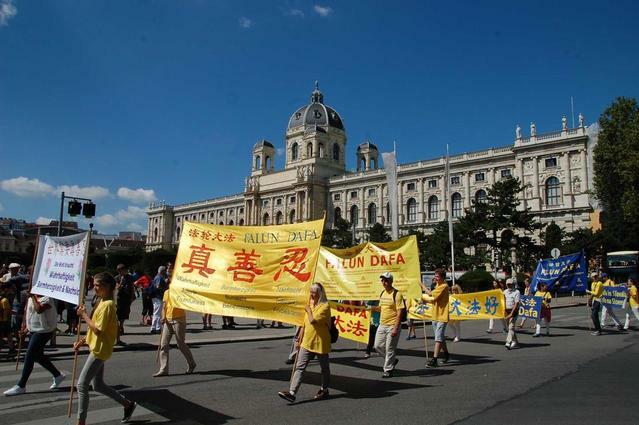 Practitioners also marched with banners calling to prosecute Jiang Zemin, the former head of the Chinese Communist Party who initiated the brutal persecution of Falun Gong, and supporting Chinese citizens who have withdrawn from the Party and its affiliated organizations. The march started from Stephansplatz, passed by Grabens, Hofburg, the Presidential Palace Square, Heroes' Square, the inner city of Vienna, and the Museum Square area before arriving at Mariahilfer Strasse, the biggest shopping center in Vienna. Many people watched the march and asked for information materials. 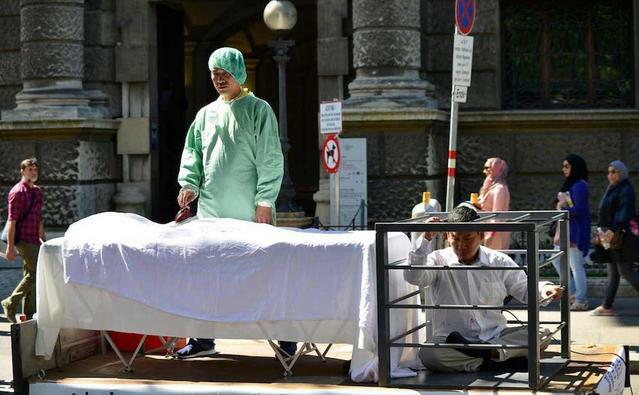 One woman said she had heard a radio program covering the persecution and organ harvesting in China. Anna works in Vienna. She and her mother took photos of the march. Anna's mother said that persecution is “too cruel” and that she recently learned about censorship and the lack of freedom of speech in China. 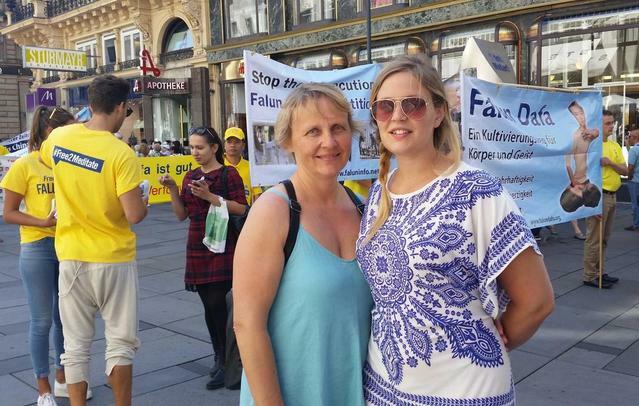 She told many of her friends about the persecution and praised the practitioners' events to raise awareness of the atrocities taking place in China.